Analytics of Things will Play a Big Role in IoT Success!! Everyday objects used for different activities are connected to each other and to the Internet such as cars, homes, appliances, industrial machines and even our roads are part of the network. This constantly evolving world is called the Internet of Things (IoT). CDN Solutions Group is a leading IT outsourcing company, consistently delivering innovative solutions. We have developed many creative projects using IoT that we will showcase in mega IT Expo Communic Indonesia 2016 at stand no. A-1306 during 31/8/2016 to 3/9/2016 at JIExpo Hall, Jakarta, Indonesia. You can also contact us for free tickets to attend this mega Jakarta International Expo here. We all know that a lot of effort is required to make a sensor, deploy them, and generate data. But what if we are not able to analyse that data? Nosense…right? When we create or develop anything, what is our purpose behind it, ofcource to make things more better or easy for use. And without any analysis, you will not reach to right conclusion. So that makes AoT important. Without analytics of things IoT is worthless. Why Analytics of Things is Playing a Big Role for IoT? Business: Anticipating the needs of the demand as well as to design personalized and innovative products and services. Savings: Identifying inefficiencies as well as optimizing processes by rationalizing costs and consumption. 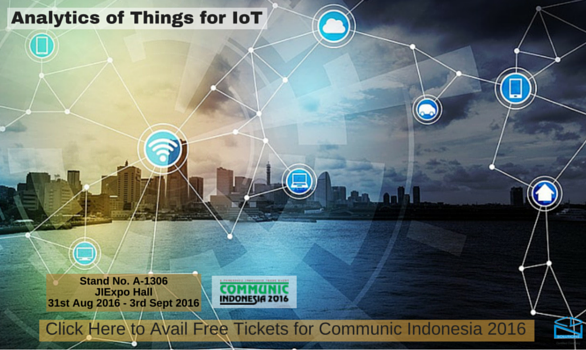 You can contact us here to know more about this topic and if you have a project of IoT to develop for, you can also meet us in Communic Indonesia 2016, Jakarta International expo event at our stand A-1306 from 31st August 2016 to 3rd September 2016 at JIExpo Hall, Jakarta, Indonesia. Avail your free passes for Jakarta International Expo here.